Polka Dot Overload | Sewing, knitting & vintage projects, tips, tutorials and cartoons! : Off to Austin! It was only after we had finished booking our family vacation to Austin, Texas that I realized I'd be missing PatternReview Weekend Austin by just a few weeks. Alas! But we have to work around the kiddo's preschool spring break and with my lack of crafterly output lately, I really have no excuses to buy fabric or yarn. Anyway, we're really just going to relax, enjoy the warmth, wander around the city and cook homemade allergy-free food in the fire pit outside the Airstream trailer we're renting to stay in. There WILL be knitting, too—I'm going to finish my cardigan, and maybe even start a new project (probably socks—I can never get enough wool socks and they are so portable). Any favorite kid-friendly things to do in Austin or the drivable near environs? Last time we were there we did a lot of margarita-drinking and eating at Mexican and barbecue restaurants, and saw the bats, but that was before kids. This time we can't really do restaurants (oh, allergies, how I hate you! grrrr!) but any tips on good farmer's markets or natural-foods stores are appreciated. P.S. 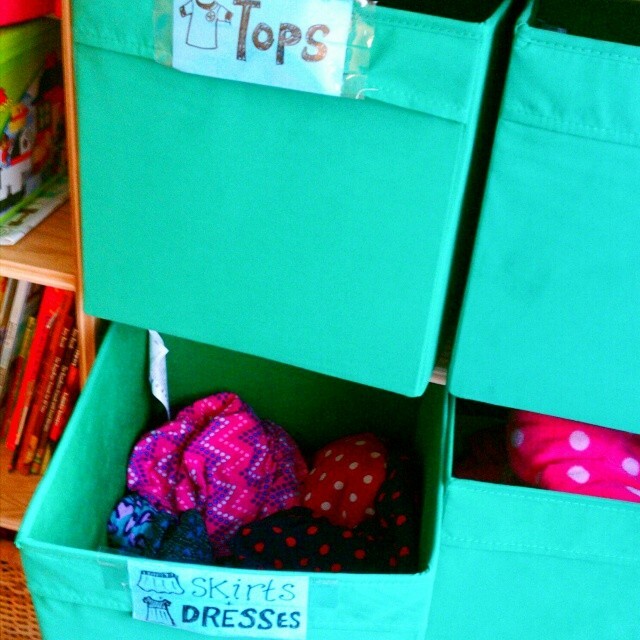 In other news, I started labeling my daughter's drawers so she could put her clothes away more accurately and realized she's as obsessed with polka dots as I am (we let her pick out fabrics and choose items from the thrift store). Her drawers are adorable. Have fun on your trip! It was nice meeting you at the unplugged meetup, Mikhaela! Awesome to meet you too!! !